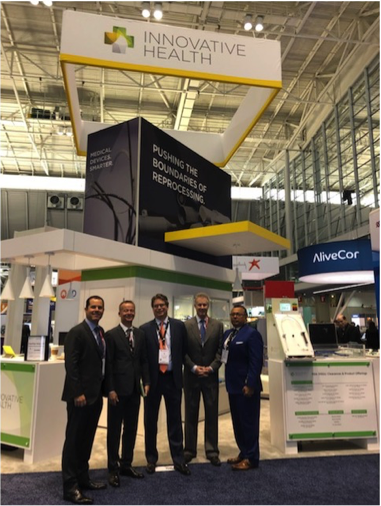 Innovative Health participated in the Heart Rhythm Society conference in Boston in May. We took a new approach to conference participation and focused on showing our reprocessed devices and demonstrating how we clean and test them. This spurred many good discussions between Innovative Health clinicians and engineers – and electrophysiologists, lab administrators, and original manufacturer representatives. We also had the opportunity to present the Reprocessed ViewFlex Xtra Intracardiac Echocardiography (ICE) Diagnostic Ultrasound Catheter, our most recent 510(k) clearance. See brief video from the conference here. Our reviews of the conference were published in MedCity News, HealthCare Business Today and Diagnostic & Interventional Cardiology. In May, Innovative Health received clearance from FDA to reprocess St. Jude’s ViewFlex Xtra Intracardiac Echocardiography (ICE) Catheter. This was exciting for a couple of different reasons: Not only is Innovative Health the only reprocessor that has clearance to reprocess this expensive, high-volume device, the clearance also showcases our ability to successfully clean and test ever more complex devices. Many EP labs turned to Innovative Health immediately and started reprocessing ViewFlex, reducing the device costs of Electrophysiology (EP) procedures considerably. DOTMed Business News published a story about our clearance with a few quotes from Rick Ferreira, Innovative Health CEO. The Association of Medical Device Reprocessors (AMDR), the global association representing Innovative Health and other single-use device reprocessing companies recently published a code of conduct that sharply defines the quality and outlook of reputable single-use device reprocessors. Additionally, in June, AMDR published on their website an inventory of anti-reprocessing techniques increasingly employed by some device manufacturers – such as bundling, forced obsolescence and refusal to support cases. The inventory consists both of a description of the technique and of how to avoid losing important savings. Innovative Health continues to expand the technological and clinical reach of reprocessing through its aggressive R&D program. The ViewFlex catheter clearance was an example of this. Since many of Innovative Health’s new submissions involve more complex technology than the past, there is intense collaboration with FDA about requirements: While hospitals are eager to save more by reprocessing more devices, these still need to be cleaned and tested so they perform equivalent to the original (predicate) devices. This means our research engineers must master the science of lumen cleaning as well as critical components such as valves. They brought some of their new methodologies to Heart Rhythm Society, where clinicians could discuss the science of lumen cleaning with us. Innovative Health currently has four (4) 510(k) submissions under review with FDA. Don’t forget to ask the other reprocessors what they have in their pipeline. Medical Product Outsourcing, April 17, 2018: “Single-Use Device Reprocessing Tailwinds and Headwinds” (Lars Thording): This piece examines the factors impacting growth, or lack thereof, of reprocessing in the current healthcare environment. SpendMatters, April 30, 2018: “Hospitals Can No Longer Afford to Pay the Bill for Increased Manufacturer Profitability” (Tom Finn): The article explores device manufacturer’s product life cycle strategies and the role of reprocessing, including the recent emergence of “specialty reprocessors” like Innovative Health Medical Design & Outsourcing – A MassDevice Resource, April 3, 2018: “How reprocessing enables medical device innovation” (Lars Thording): This article explores the role of reprocessing in innovation; the financial crisis in healthcare forces us to rethink what innovation in medical technology is and should be, and reprocessing has a critical role to play. In April, Innovative Health published the whitepaper “Why Hospital Leaders Should Look to Cardiology for Sustained Future Reprocessing Savings”. The whitepaper focuses on five reasons why savvy hospital executives are looking to utilize reprocessing programs specific to the EP and Cath lab. These five reasons include very rapid growth of AF ablation procedures with a reimbursement level that simply isn’t sustainable; short technology life cycles in cardiology and the absence of commoditization; the sheer magnitude of the savings opportunity in the EP lab; the lack of economic basis for EP cases; and the frequency of EP related FDA reprocessing clearances. As a part of the reverse engineering process that Innovative Health goes through to obtain FDA clearances, our engineers must address more and more complex techniques from manufacturers trying to prevent reprocessing and reduce savings. Our June whitepaper, “Restrictive Device Innovation - How Manufacturers Design Devices to Prevent Re-Use” will demonstrate this in detail. Many techniques are solely used to block reprocessing – including placing a chip inside the handle to prevent re-use; the handle shrouded with heat-shrink to prevent access to the chip, use of epoxy and metal shrouds to protect chip and much more. Innovative Health packaging engineers are in constant dialogue with our customer service team to ensure that our device packaging is simple, safe and practical for the hospital staff. As a result of this, the Webster CS catheter will soon be available to all customers in straight packaging. We ask that all customers continue to tell us if and where we can make improvements.